Apple never stopped improving and polishing the cameras on its iPhones, but it took it a while to move from an 8-megapixel sensor (starting with the iPhone 4S) to a 12-megapixel one with the iPhone 6s. But since the resolving power of previous iPhones never really bothered us, come announcement, we were more interested in another possible (and sometimes rumored) improvement: optical stabilization. Unfortunately, Apple didn't deviate from the blueprint it laid out with the iPhone 6 and 6 Plus, and so only the iPhone 6s Plus phablet received the stabilizing gizmo. Like its predecessor, the iPhone 6s is left to cope with a software solution, which is actually pretty darn good. So good, in fact, that we thought we'd pit the new iPhone against the Galaxy S6. On paper, Samsung's flagship is better prepared for a stabilization test, for it checks both boxes: it has its own set of software algorithms to help stabilize video, but also a physical image stabilizer integrated with the lens. So when you move about, the lens of the camera follows your lead, too. Does that mean steadier footage, however? The answer is yes and no at the same time. If it's a real shaky situation you got yourself into, you can count on the Galaxy S6 to better adapt and offer slightly smoother footage than the iPhone 6s, which uses buffer pixels to cut out portions of the raw footage it takes to deliver a better video. But if we're talking an everyday, typical clip, the iPhone 6s manages to keep the image more stable, whilst the S6's is wobbly and jerky. Indeed, the thing we don't quite dig about the Galaxy S6's footage is the jelly-like effect it adds when the lens moves to compensate for shake. Get ready for some serious trolling. Let me get the popcorn. If you are having that jello effect with the Galaxy S6, just disable video stabilization from the camera settings. That will disable the DIS and the camera will only use OIS. 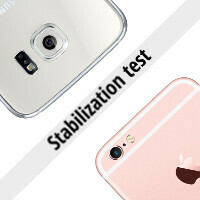 In my testing, the stabilization also get's better by disabling DIS, suggesting Samsung screwed up DIS algorithm. https://youtu.be/oqH9clE4ne0?t=2931 However, there is still hope for the S6. The above video shows how much better the DIS on Note 5 is compared to S6, suggesting that Samsung can push this via a firmware update. On an entire other note(no pun intended), the S6 absolutely mutilates the iPhone in audio. Agreed. The audio on the iPhone is awful. What is the benefit to shoot in 4k when audio is such a crap? Can you imagine audio quality on noisy place or concert?!? I don't use the camera on my phone's much, but I just got the Note 5,so I took a quick test video at work two days ago. I was really impressed with how smooth the video was, and really popped as HD. This was taken at 1440p, I still haven't tried 4k. Samsung didn't screw up. It's something obvious. OiS doesn't rely on software. DIS interferes with it. So yeah what you said is 100% true. But see the video i gave a link to above. The note 5 does much better with DIS + OIS. It's about tweaking the DIS to not interfere with OIS. Apple too finally is using OIS + DIS in 6s+ while it only used DIS for video in 6+. Companies are figuring out ways of making them work coherently. And we have 2 live examples. Iphone 5s 8mp f/2.2 sensor size 1/3 pixel size 1.5 IPhone 6 8mp f/2.2 sensor size 1/3 pixel size 1.5 Yeah it never stopped and wtf u say that it have dual led i only see one. IPhone 6s 12mp f/2.2 sensor size 1/3 pixel size 1.22 so since mp don't improve image quality iPhone 6s is a flop from iPhone 6 in image department. Nah, the s6 is clearly better than the ip6s. 6s' footage is definitely a bit more shaky. Anyway, go and buy a real physical stabilisers and you'll have a steady shot. A comparison with the z5 is needed! Sony is so screwed right now they might abandon making phones altogether. Their one notch above HTC at this stage. S6 has optical, 6S digital, yet the 6S seems to be overall smoother. It seems like the S6 actually sticks a bit then jumps. Yes I have my popcorn. I think the S6 is a little sticky. I recorded it and put it on Facebook, so far the 6S is winning 10 likes to 2. PA really need to educate themselves before writing their articles. I suggest googling for rolling shutter and scraping half of it. Nikkajedi is such an iSheep. Smh...... I love it how the Apple crowd disses Samsung yet claim to have an S6. Nice lie. Stupid comparison. You are not even using same stand. Ok walking and holding a camera is kind of a dumb test imo. As long as the ois keeps my videos still while I am it's doing it's job. This is not Blair Witch project. The video quality on the S6 DESTROYED the iPhone. Wow!